The Bombay Stock Exchange benchmark Sensex today recorded its second biggest gain of 350 points this year to regain the psychological 16,000 level on funds buying spurred by firm global cues and hopes of rate cuts by the Reserve Bank of India after easing inflation. After a better start, the Sensex spurted by 350.37 points, or 2.22% to 16,165.09, a level last seen on December 13 last year, and the second biggest gain after January 3. The ongoing Auto Expo is not just about glamorous cars and superbikes being unveiled but also about caring for the future with the focus on the environment. With petrol prices shooting up and environment pollution becoming a major concern, hybrid cars and those powered by electric engines have come into the spotlight at the show’s 11th edition. The Gulf countries are looking to make big buck investments in India following their withdrawal from Europe and the visit of Sheikh Hamed bin Zayed al Nahyan, managing director of the Abu Dhabi Investment Authority (ADIA), one of the world’s largest sovereign funds with investible funds of US $700 billion on January 16, will be an important trigger for expansion of investment opportunities in India. The Reserve Bank of India is unlikely to cut banks' cash reserve ratio at its January 24 policy review, Pratip Chaudhuri, chairman of State Bank of India, the country's largest lender, said Tuesday. Burdened by debts and losses, Kingfisher Airlines sought government help on extending the time for repaying the banks and credit for its jet fuel requirements to avoid serious disruption of it operations. Helped by a sharp depreciation in rupee, Indian IT companies are expected to post an average earning growth of up to 23% for the third quarter of the current fiscal. Retirement fund body EPFO may lower the interest rate on deposits to 8.6 per cent for the over 4.7 crore subscribers for fiscal 2011-12 to match it with the rate of the public provident fund (PPF) scheme. Belying concerns over slowdown, indirect tax collections increased 16.1 per cent to Rs 285,787 crore during April-December 2011, mainly driven by an uptick in service tax mop up. Total collections of indirect taxes — customs, central excise and service tax — was Rs 246,168 crore in the same period last year. Brokers said a firming global trend on speculation European officials will take measures to resolve the region's debt turmoil boosted market sentiments. The broadbased National Stock Exchange index Nifty shot up by 106.75 points, or 2.25% to 4,849.55 with stocks of realty, capital goods and banking sector recording handsome gains. Reliance Industries zoomed 3.99% to Rs 735.15 and Infosys by 0.94% to Rs 2,863. The two carry nearly 20% weightage on the Sensex. State Bank of India surged 3.93% to Rs 1,702.05. 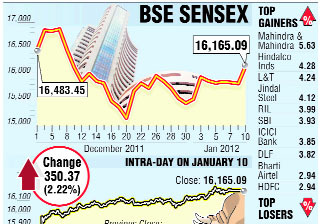 In 30-BSE index kitty stocks, barring GAIL India and Tata Consultancy Services, all closed with gains. All the 13 sectoral indices were in positive zone with gains up to 4.20%. Besides, another aspect of the fair which has gone under noticed is the launch of more luxurious and comfortable commercial vehicles. Commercial vehicles manufacturers, both from India and abroad, have taken the Delhi Auto Expo to another level while showcasing their new offerings in the shape of future buses and trucks. Although most experts agree India is still not ready for going green in the automotive segment, automakers have still come out in large numbers to showcase their future models based on greener technology. 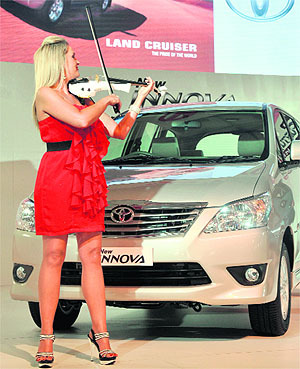 Almost all major carmakers have displayed their hybrid vehicles or those running with “greener” fuels like CNG and LPG. Peugeot SA of France, a new entrant in India, put on show its hybrid car 3008, while Maruti Suzuki India showcased the hybrid variant of its popular hatchback Swift. Similarly, Tata Motors unveiled its Manza hybrid sedan, while Mahindra & Mahindra put on show the Reva NXR electric vehicle, likely to be launched later this year. Another major attraction of the fair is the world's largest-selling electric car, the Leaf, from Nissan. Betting big on the Indian market, German auto major Volkswagen showcased its concept XL1 that comes with a 0.8 litre engine giving 48 PS of power. 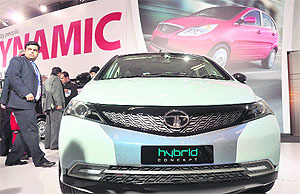 Besides showcasing the Manza hybrid and a hybrid bus, Tata is also keen to bring in its Nano CNG model soon. Among bus manufacturers, Volvo displayed its hybrid bus and is keen on introducing it in India for intercity transport. The world's largest two-wheeler manufacturer, Hero MotoCorp, unveiled its first concept hybrid scooter, the Leap, which has been developed indigenously. Besides, the world’s first hydrogen powered three-wheeler, the HyAlfa, was showcased at the fair on Monday. Hamed has told Indian government representatives ADIA wanted to be a strategic partner and the United Arab Emirates is withdrawing from Europe to invest in Southeast Asia and BRIC countries. This is among a series of high profile visits from the Gulf countries to India. Saudi Arabia’s commerce & industry minister Tawfiq Bin Fawzan Al-Rabiah was here in the first week of January and met his Indian counterpart, Anand Sharma, as also members of the industry chambers. Saudi Prince Alwaleed bin Talal bin Abdulaziz al Saud had a few months ago met Reliance Industries chief Mukesh Ambani and Tata group chairman Ratan Tata. In his interactions with Indian government representatives Hamed has emphasized ADIA wanted to be a strategic partner of India with long term objectives. He said ADIA had diverted part of its investments to Southeast Asian countries after withdrawing from Europe, which he said was having economic problems. The UAE is keen to invest in India with which it enjoys a historical relationship. ADIA also pointed out that, in the light of the current economic downturn in Europe, emerging countries like China, Brazil and India should grab the opportunity to attract investments. While China and Brazil had taken some significant initiatives, the UAE is keen to know what were the steps India had initiated to attract investments. Hamed will be meeting Sharma and other government functionaries. While India’s trade with the UAE touched an unprecedented $67 billion in 2010-11, the latter’s investments in India have not kept pace with this trend. In this context, UAE foreign minister Sheikh Abdullah, during his visit to India last June, had proposed the setting up of a joint task force to promote investments. Hamed, being the head of ADIA, is likely to play an important role in its implementation. He also said it would be difficult for banks to lower deposit rates in the current environment of high interest rates. "A CRR cut is unlikely — that’s my personal view. But, we’ve asked them to pay interest on it," he told Reuters. The RBI has kept the CRR — the proportion of deposits banks keep in cash with RBI —unchanged at 6% even as it increased its policy rate 13 times to 8.5%, its highest since July 2008, since March 2010. On Tuesday, select bankers, including Chaudhuri, met RBI deputy governor Subir Gokarn, in charge of monetary policy review. The customary meeting was to discuss macroeconomic factors. Lenders, worried over the slow pace of credit growth, asked the central bank to lower its policy rate and the CRR, said K. Ramakrishnan, chief executive of Indian Banks' Association. Indian banks' loans grew 17% in the year to December 16 compared with nearly 24% in the same period a year ago, according to RBI's latest weekly data. The RBI has forecast a credit growth of 18% for the current financial year ending March 2012. "Indications at this point of time are that credit growth will be 16% for the current financial year," Ramakrishnan said. "Bankers want CRR cut and policy rate cut to send out a signal that it is time to think about growth," he added. Kingfisher Airlines’ promoter. Vijay Mallya, is understood to have written to Civil Aviation Minister Ajit Singh seeking help on these issues, saying the airline's lessors have moved court in the United Kigdom on alleged nonpayment of lease rentals on aircraft. Mallya is believed to have said if help on these matters was not forthcoming, then it could adversely affect Kingfisher's normal operations. While the UB Group chief has sought a 15-day credit from Hindustan Petroleum Corp Ltd to meet its fuel requirements, it has also sought a temporary extension of time to repay the banks for its working capital loans. He is understood to have indicated that since the aircraft lessors have gone to court, immediate payments have to be made to them to keep the fleet of the private airline flying. When contacted, a Kingfisher spokesperson on Tuesday refused to comment on the matter. In recent weeks, Mallya, who is also a Rajya Sabha MP, has held a series of meetings with top government functionaries, including Finance Minister Pranab Mukherjee, to work out steps to keep the airline afloat. Kingfisher has also come under flak from the sector’s regulator, the Directorate General of Civil Aviation, over safety issues following a financial surveillance. Experts believe the sharp rise in profitability would be largely driven by a depreciating rupee vis-a-vis the US dollar. "We expect our IT coverage universe to register earnings growth of 23% on the back of strong 31% top line growth," brokerage firm Angel Broking said in a report. Religare Institutional Research, part of Religare group, said in another report that IT firms may register an average of 17.8% rise in profitability in the Oct-Dec quarter of the current fiscal. Besides, revenue growth of these firms are expected to around 29.2% in Q3, Religare said. Among others, large software exporters such as Tata Consultancy Services, Infosys and Wipro would report a positive impact of the currency market trends, when they report their earnings for the September-December quarter. Profitability of companies like TCS, Infosys and Wipro is expected to rebound by a healthy 25.1%, 23.4% and 12.8%, respectively, resulting in combined average profit after tax growth of 21.6%. In addition, sales growth for these top three IT service providers in year-on-year terms is expected to be about 31.3%. The Employees' Provident Fund Organization had provided 9.5% interest rate to its subscribers for 2010-11 after it found Rs 1,731 crone surplus in its books of account. "The labour ministry will soon be sending a note to the finance ministry, recommending 8.6% rate of interest on provident fund deposits to EPFO subscribers for this fiscal as provided under PPF scheme", a source privy to the development said Tuesday. "We hope we’ll be able to meet the budget estimates of Rs 392,908 crore (from indirect taxes) this fiscal," Central Board of Excise& Customs chairman SK Goel told reporters while releasing the data. The indirect tax collection in three quarters of 2011-12 is about 72.7% of the budget estimates.